This is the most popular of our home kits, the Sierra represents the style you see most often, and boasts our stand alone frame system. 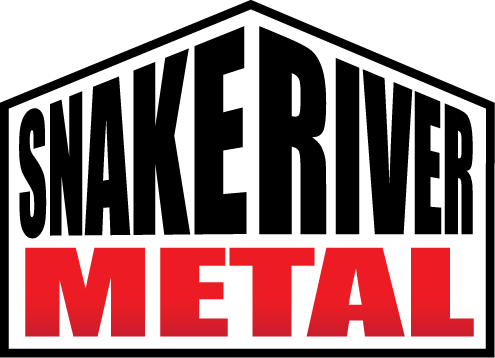 The stand alone system easily allows you to clad or cover the outside of your building with most any type of exterior material, without modifying the frame system or having to add steel components in order to attach your chosen exterior materials. 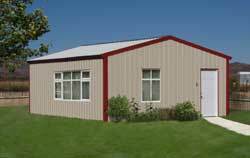 The Mohave is the most economical purchase of all our steel kit homes. 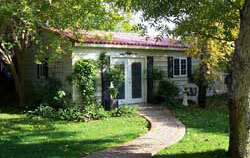 Its horizontally running exterior wall panels can give it a siding-like appearance that is a popular residential look. With those two important benefits the Mohave style steel building kit could quite possibly be the model you choose for yourself. House kits in the Teton style feature heavy-gauge exterior panels, designed with the appearance of wood shiplap siding. These panels and the Teton’s larger eave overhang give it an especially traditional, homey look. 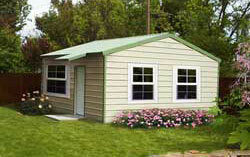 You’re sure to recognize the Gambrel style cabin kit’s signature roof design. Yes, it’s the same design used on big barns across the land. It just happens that that design – sometimes called a Dutch hip or Dutch gambrel – makes for an ideal cabin. The steeply sloping roof sheds snow with ease. And there’s plenty of room up there for storage. 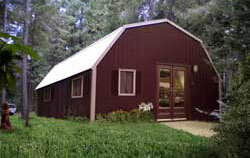 Or better still, you can even choose that old cabin favorite, a space-efficient and cozy loft!